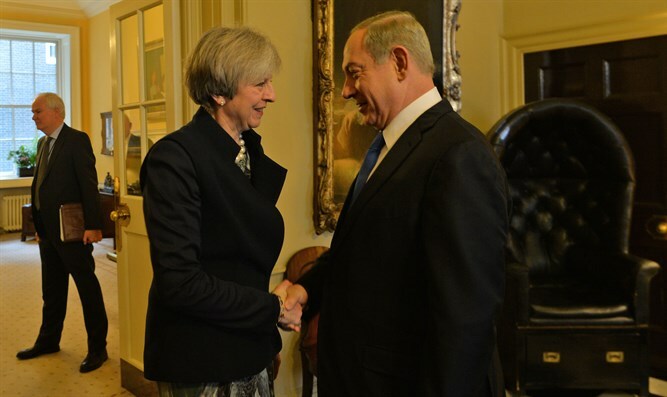 British government slams Regulation Law passage, EU freezes planned summit with Israel. While the United States has refused to condemn passage of the Regulation Law Monday night, Britain and the European Union slammed the legislation on Tuesday, saying that it threatened the pursuit of a two-state solution. Neither referrred to the previous situation on Cyprus, when Greeks were allowed to recompense Turks for building on their land when the island was divided rather than abandon their home, this with the consent of the Hague Court. The British government warned Israel in a statement Tuesday that the law would diminish the Jewish state’s position around the world. The statement, issued by Minister for the Middle East Tobias Ellwood, comes on the heels of a meeting between UK Prime Minister Theresa May and Israeli Premier Binyamin Netanyahu. "As a longstanding friend of Israel, I condemn the passing of the Land Regularization Bill by the Knesset, which damages Israel’s standing with its international partners," said Ellwood. "It is of great concern," he continued, "that the bill paves the way for significant growth in settlements deep in the West Bank, threatening the viability of the two-state solution. We reiterate our support for a two-state solution leading to a secure Israel that is safe from terrorism, and a contiguous, viable, and sovereign Palestinian state." The European Union also chastised Israel over the law’s passage, delaying a meeting between EU and Israeli officials long seen as a step towards mending strained relations. The summit, slated for the end of February, has now been postponed indefinitely.